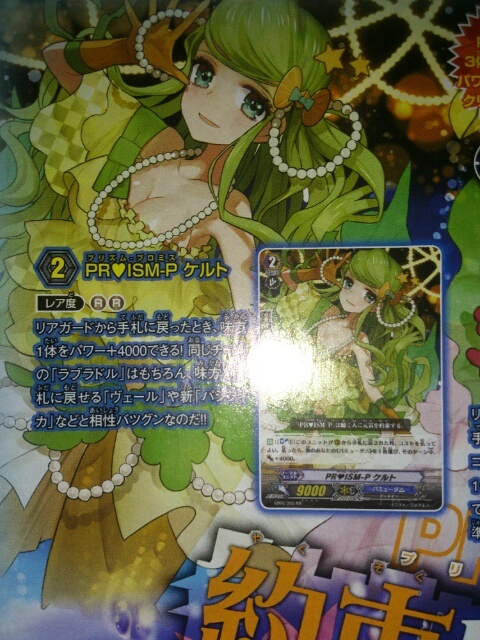 [BT11] New picture, new card ! Blaster Dark is not the only thing new for today ! 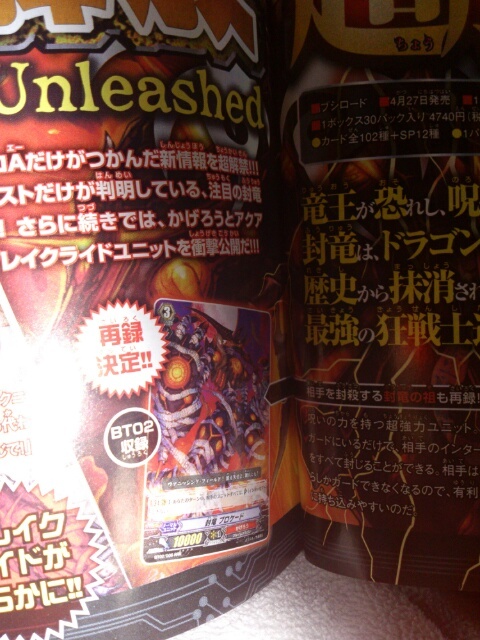 [AUTO] Limit Break 4 (This ability is active if you have four or more damage):When an «Angel Feather» rides this unit, you may choose one of your vanguards, and that unit gets [Power]+10000, and select one face-up unit in your Damage Zone, and add it onto your hand. Then, place the top card of your deck onto the Damage Zone. 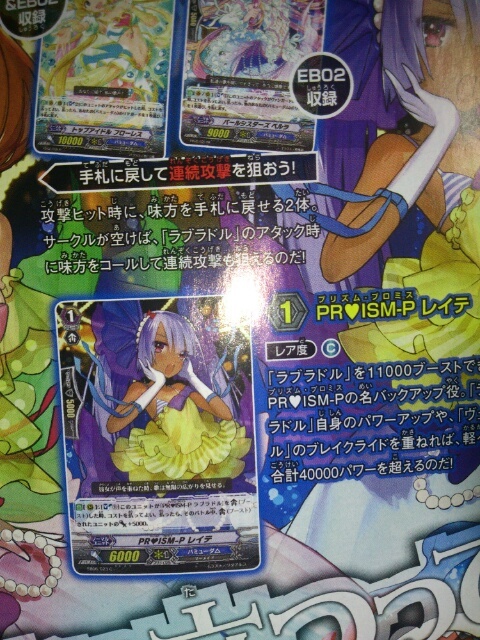 [AUTO]: [Choose a «Genesis» from your hand, and discard it] When this unit is placed on (GC), you may pay the cost. If you do, choose one of your «Genesis» that is being attacked, and that unit cannot be hit until end of that battle. A young girl who belongs to a family that manipulates the « Gohou », arcane magic that allows someone to create sturdy magical walls via force of will and meditation. She was appointed as one of the first members of « Genesis », based on her rating of her power, which is the strongest in her entire family. But, because of her talents, she has seen very little of the outside world, resulting in her finding much of war and combat far too stimulating. She even fainted when she heard a gunshot for the first time during simulation training. By now, she no longer faints, but she still has a timid nature, as she shakes and shivers as she recites the prayers that create the magical wall. There are very few that know that the Goddess of Volunteering who controls a huge team across the entire company is in fact actually this shy, timid wallflower of a girl. [AUTO]: [Choose a «Narukami» from your hand, and discard it] When this unit is placed on (GC), you may pay the cost. If you do, choose one of your «Narukami» that is being attacked, and that unit cannot be hit until end of that battle. 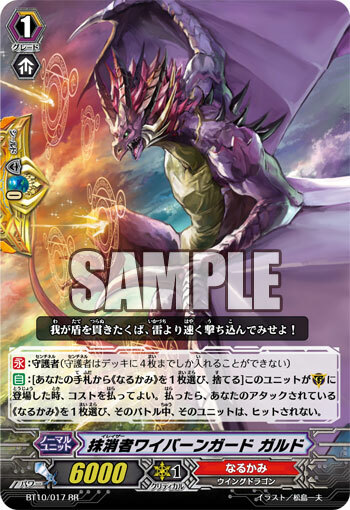 The Winged Dragon Guld, who survived the chaotic era, obtained further power and became one of the Eradicators. His body and skeleton have undergone multiple transformations in the past, as a proof of his exceptional-ism, plus a rise in precision marksmanship, and his ability to activate a practically omni-directional defense, has resulted in him being an unprecedented member of his team. For countries that were weakened by the ceasefire of the « War of Liberation », that seek to regain their military ground, his shield has made it harder than ever for them, even if invasion was already difficult for them. It is the most powerful defense there is, stronger than any suit of armor or shield, it is the defense made by « Narukami », those who control thunder and lightning itself. Those who cannot get past this stronghold have no right to fight dragons. The Special Forces consisting of the most faithful and loyal in all the empire, made up of warriors from one of the two major military pillars of the « Dragon Empire », Narukami. Their mission is to literally « eradicate » any who would cross the empire, and no matter how peaceful things get, they are specially trained to be as cruel and ruthless as needed to get things done. As well, those appointed with the title « Eradicator », only their superiors and other Eradicators know who they are, with their fellow troops unaware as to their true rank. [AUTO]: [Choose a «Gold Paladin» from your hand, and discard it] When this unit is placed on (GC), you may pay the cost. If you do, choose one of your «Gold Paladin» that is being attacked, and that unit cannot be hit until end of that battle. One of the « Liberators » he serves as a Garrison Commander of the Golden Paladins. Just as the Gold Paladins became a part of the standing military, he planned to hand over the seat of captain to someone more accomplished and skilled than him, but due to a strong recommendation from Iseult herself, he formally became a garrison commander in the second standing army. Now standing at the same heights as the same « Captain » he once admired, he sees the world the same way as her. As a result, his will and sense of responsibility have been refined, and have been encouraged to grow even further. The experience he gained in his youth now brings forth possibilities in the future. The delicate light comes together to produce a strong light. Justice… duty… his determination… … … They are all intertwined with him like light, giving his « Halo Shield » the power to protect his friends and allies. The general term for those chosen from the second standing army of United Sanctuary, « The Gold Paladins », they are the few that the King of Knights has entrusted with the mission of protecting not only the Sanctuary, but the entire world of Cray. They were named the « Liberators » because they liberate all who have been ensnared by the schemes of the wicked. Those with the title are said to be the guiding hand of the new era. At the center of the group are the young warriors who saved the day, known as the « Gold Paladins », but some of their number are battle-scarred veterans who were handpicked for the job. [AUTO]: [Choose a «Royal Paladin» from your hand, and discard it] When this unit is placed on (GC), you may pay the cost. If you do, choose one of your «Royal Paladin» that is being attacked, and that unit cannot be hit until end of that battle. A Shield Knight who unites the Royal Paladin Garrison. She possesses a translucent magical jewel that can absorb light. After she returned, she was recommended as a captain of the « Gold Paladin » garrison, but she declined, instead recommending « Mark » for the job, citing how much he grew and accomplished, and stated « The only right for the job of Gold Paladin Garrison Commander is « Halo Shield », as he already knows you guys. ». She returned as a Garrison Captain of the « Royal Paladins », as a member of the « Jewel Knights ». The quality of her light has not declined with time. It’s still the same « Flash Shield ». Even now, and in the future, her thoughts and feelings will continue to be flashing light that will continue to protect those dear to her. One of the titles handed out to elite knights in the first army of United Sanctuary, « Royal Paladin ». Those chosen wear and use armor and equip that are covered in gorgeous gemstones and jewels containing with magical power known as Magical Jewels, causing them to also be known as the most fabulous and glamorous knights in the army. Those who belong to their numbers combine the traditional style of a knight along with the additional supernatural power of magic, and are nicknamed the « Knights of the Magical Treasures » due to their equipment and the tactics they employ using them. And here is our monthly storm of news for Vanguard ! 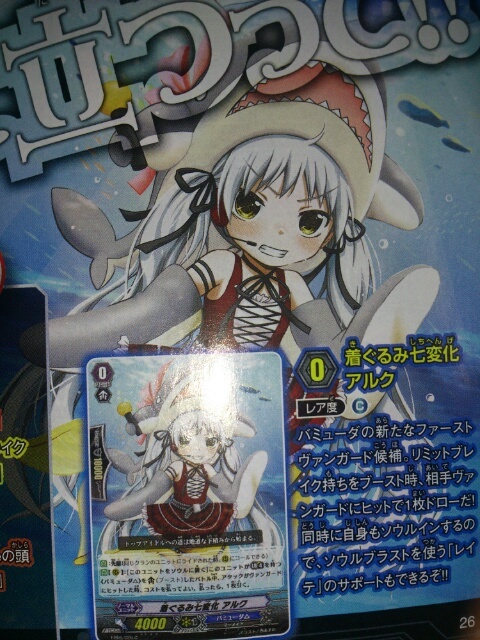 What is next is teasing some BT11’s Kageros but more importantly, the return of Bermuda Triangle in EB06 ! 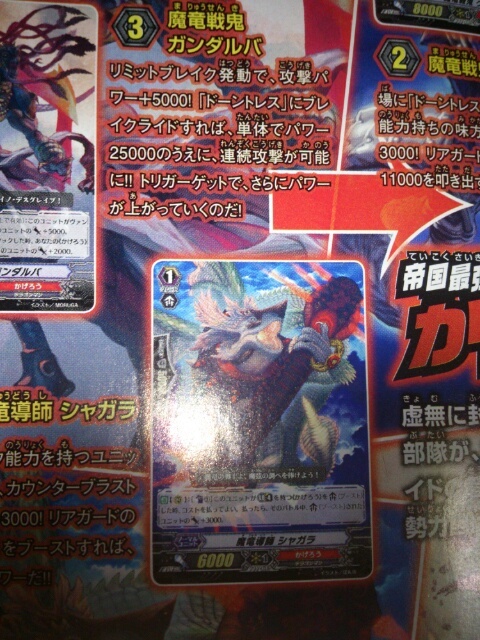 Seal Dragon, Blockade gets a reprint. 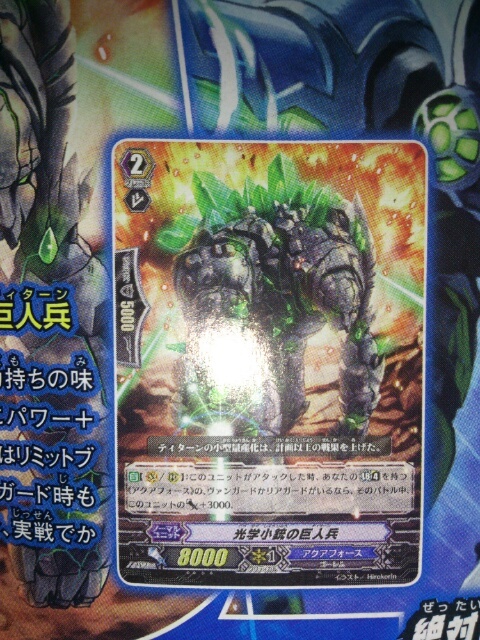 [AUTO](RC):[Counter Blast (1)] When this unit boosts a «Kagerō» that has Limit Break 4, you may pay the cost. If you do, the boosted unit gets [Power]+3000 until end of that battle. 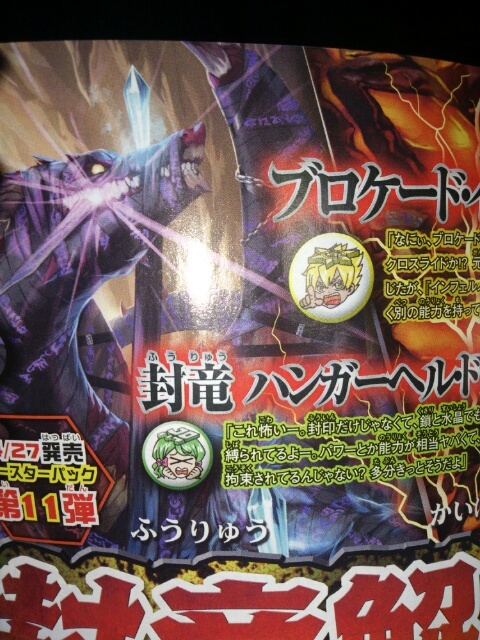 [AUTO](VC/RC):When this unit attacks, if you have a «Kagerō» vanguard or rear-guard that has Limit Break 4, this unit gets [Power]+3000 until end of that battle. 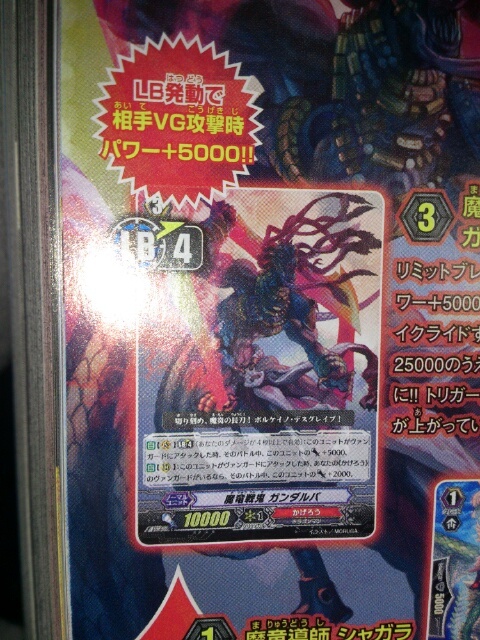 [AUTO](VC) Limit Break 4 (This ability is active if you have four or more damage):When this unit attacks a vanguard, this unit gets [Power]+5000 until end of that battle. 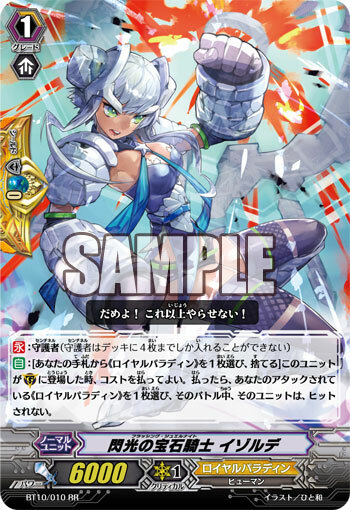 [AUTO](RC):When this unit attacks a vanguard, if you have a «Kagerō» vanguard, this unit gets [Power]+2000 until end of that battle. 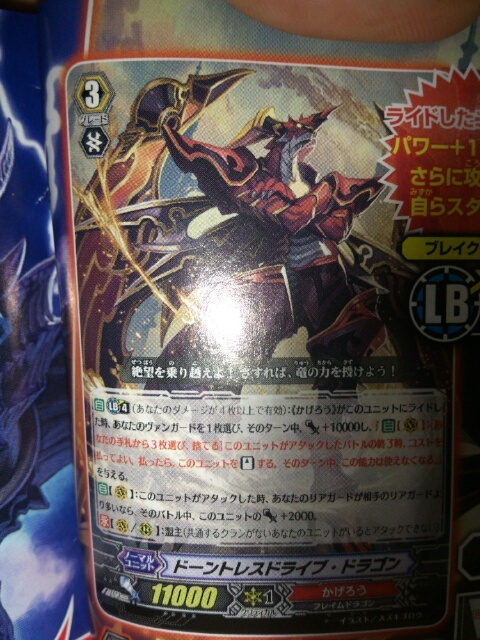 [AUTO] Limit Break 4 (This ability is active if you have four or more damage):When a «Kagero» rides this unit, choose one of your vanguard, that unit gets [Power]+10000 and gets « [AUTO](VC):[Choose three cards from your hand, and discard them] At the beginning of the close step of a battle that this unit attacked, you may pay the cost. If you do, [Stand] this unit. This ability can only be used once per turn. » until end of turn. 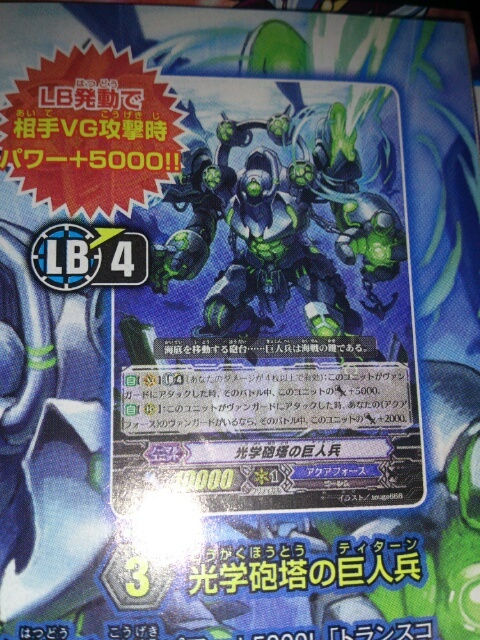 [AUTO](VC):When this unit attacks a vanguard, if the number of rear-guards you have is more than your opponent’s, this unit gets [Power]+2000 until end of that battle. 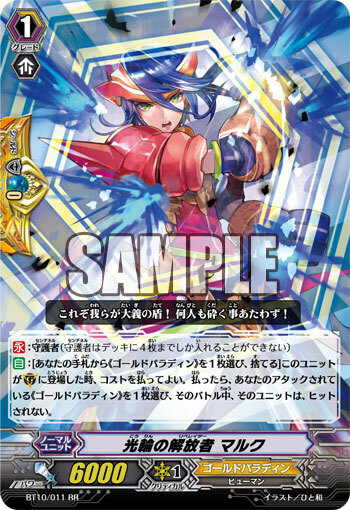 [AUTO](RC):When this unit attacks a vanguard, if you have an «Aqua Force» vanguard, this unit gets [Power]+2000 until end of that battle. 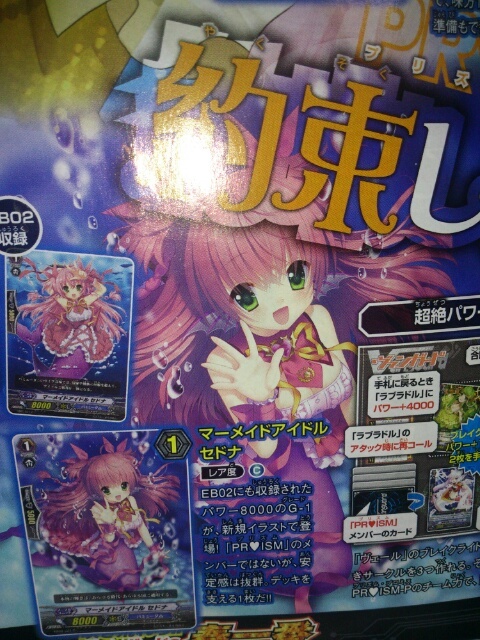 [AUTO](VC/RC):When this unit attacks, if you have an «Aqua Force» vanguard or rear-guard that has Limit Break 4, this unit gets [Power]+3000 until end of that battle. 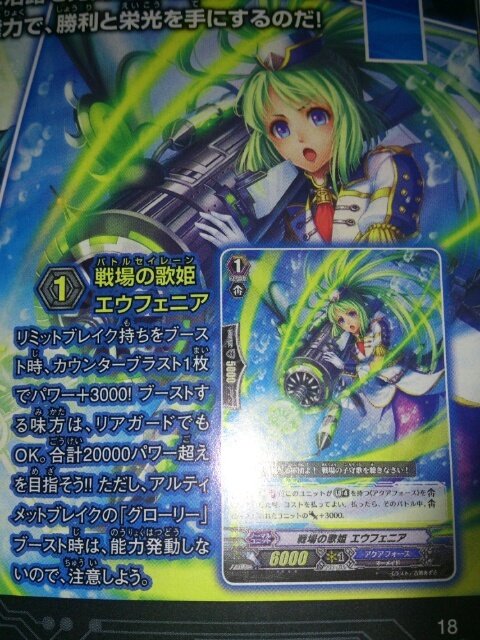 [AUTO](RC):[Counter Blast (1)] When this unit boosts an «Aqua Force» that has Limit Break 4, you may pay the cost. If you do, the boosted unit gets [Power]+3000 until end of that battle. 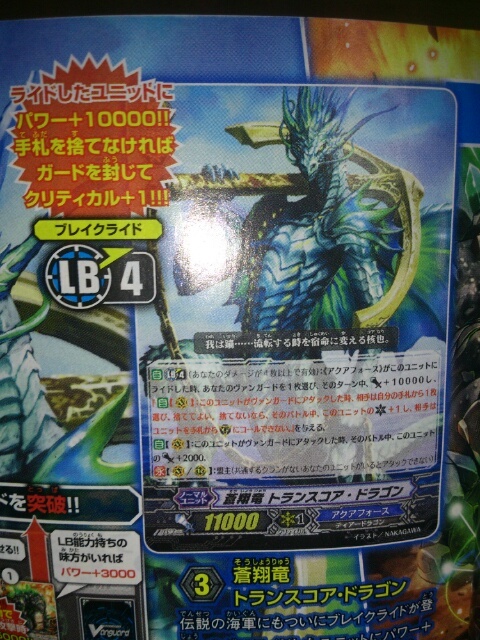 [AUTO] Limit Break 4 (This ability is active if you have four or more damage):When a «Aqua Force» rides this unit, choose one of your vanguard, that unit gets [Power]+10000 and gets « [AUTO](VC):When this unit attacks a vanguard, your opponent may choose one card from his or her hand, and discard it. If they do not, this unit gets [Critical]+1, and your opponent cannot normal call units to (GC) until end of that battle. » until end of turn. 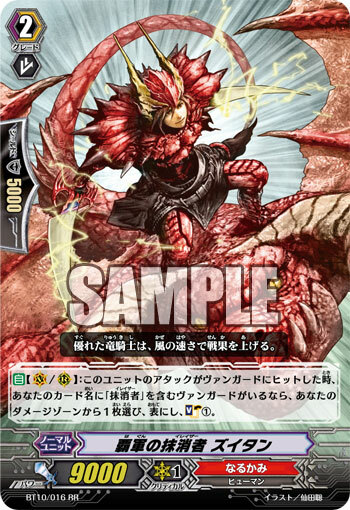 [AUTO](VC) Limit Break 4 (This ability is active if you have four or more damage):When a «Bermuda Triangle» rides this unit, draw a card, choose up to two of your «Bermuda Triangle» rear-guards, return them to your hand, and choose one of your vanguards, and that unit gets [Power]+10000 until end of turn. 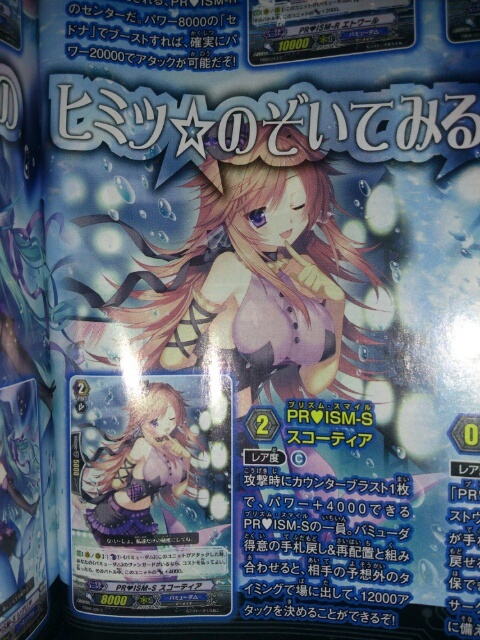 [CONT](VC):During your turn, if the number of «Bermuda Triangle» rear-guards you have is four or more, this unit gets [Power]+2000. [AUTO](VC) Limit Break 4 (This ability is active if you have four or more damage):[Counter Blast (3)] When this unit attacks, you may pay the cost. If you do, choose up to two of your «Bermuda Triangle» rear-guards, return those units to your hand, search your deck for up to one «Bermuda Triangle», call it to (RC), and shuffle your deck. 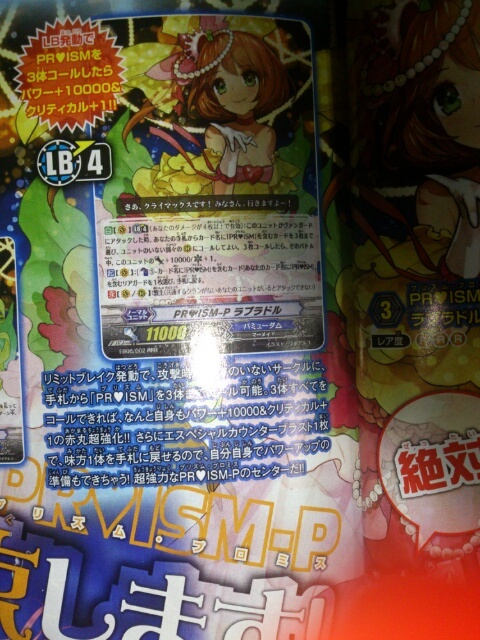 [CONT](VC):If you have a card named « Top Idol Pacifica » in your soul, this unit gets [Power]+2000. 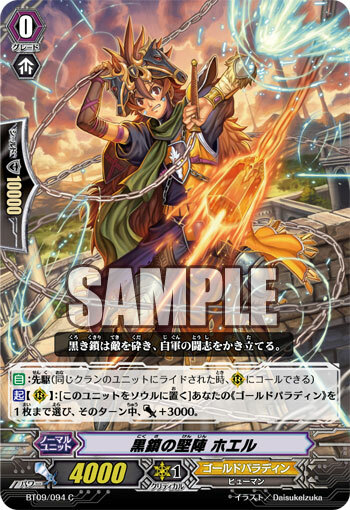 [AUTO](VC) Limit Break 4 (This ability is active if you have four or more damage):When this unit attacks a vanguard, choose up to three cards with « PR♥ISM » in its card name from your hand, you may call them to separate open (RC), and if three or more were called this way, this unit gets [Power]+10000/[Critical]+1 until end of that battle. 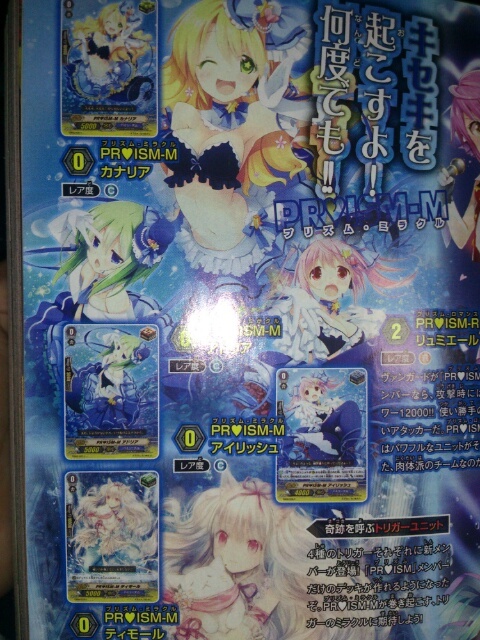 [ACT](VC):[Counter Blast (1) – Cards with « PR♥ISM » in its card name] Choose one of your rear-guards with « PR♥ISM » in its card name, and return it to your hand. 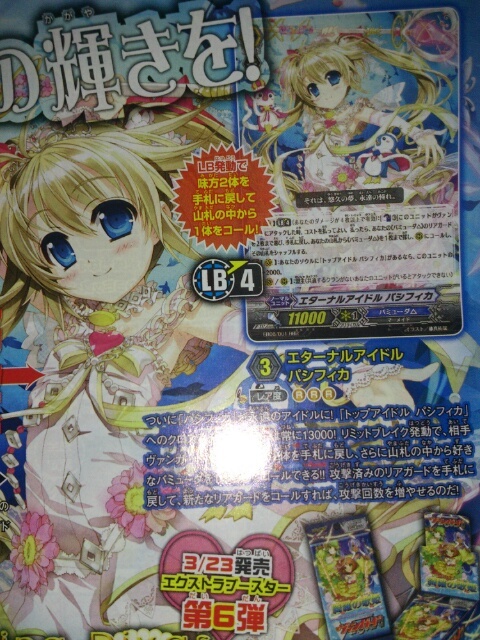 [AUTO](VC/RC): When this unit is boosted by a «Bermuda Triangle», this unit gets [Power]+2000 until end of that battle. [AUTO][Soul Blast (1)] When this unit is returned from a rear-guard circle to your hand, you may pay the cost. If you do, choose one of your , that unit gets power +4000 until end of the turn. 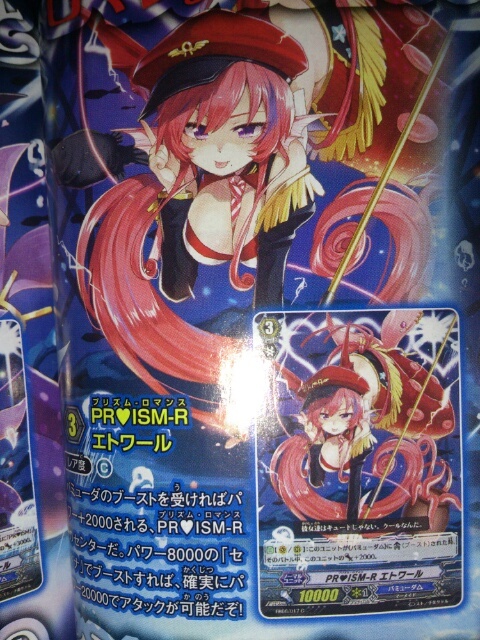 [AUTO](RC):When this unit attacks, if you have a vanguard with « PR♥ISM » in its card name, this unit gets [Power]+3000 until end of that battle. 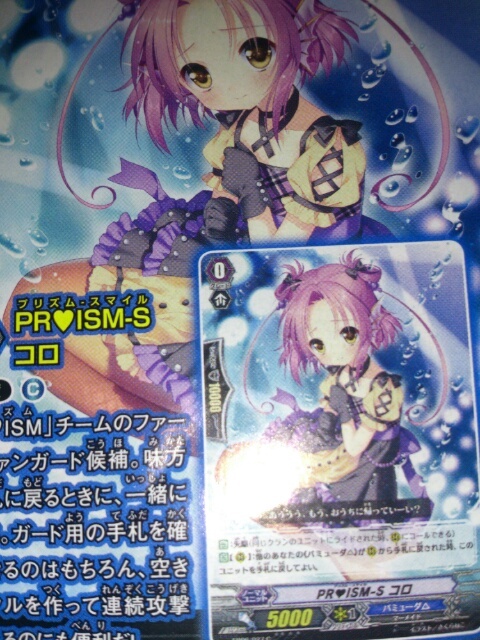 [AUTO]:[Choose a «Bermuda Triangle» from your hand, and discard it] When this unit is placed on (GC), you may pay the cost. If you do, choose one of your «Bermuda Triangle» that is being attacked, and that unit cannot be hit until end of that battle. [AUTO](VC/RC):[Counter Blast(1) – «Bermuda Triangle»] When this unit attacks, if you have a «Bermuda Triangle» vanguard, you may pay the cost. If you do, this unit gets [Power]+4000 until end of that battle. 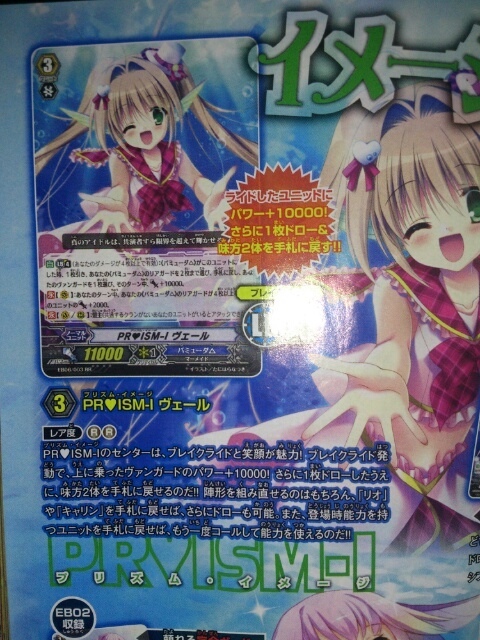 [AUTO](RC):[Soul Blast (1)] When this unit boosts a card named PR♥ISM-P Labrador, you may pay the cost. If you do, the boosted unit gets [Power]+5000 until end of that battle. 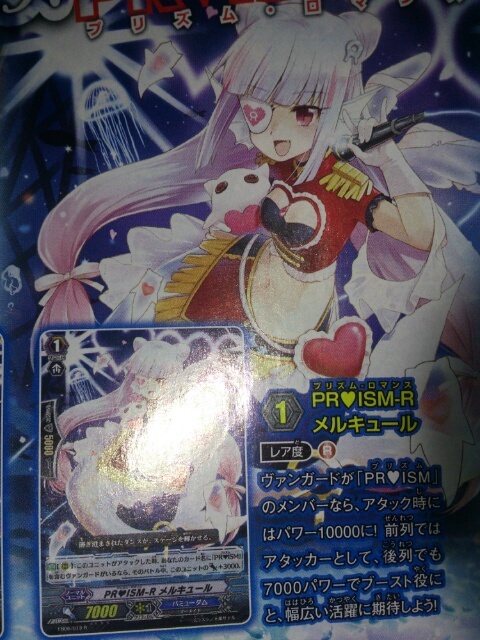 [AUTO](RC): When this unit attacks, if you have a vanguard with « PR♥ISM » in its card name, this unit gets [Power]+3000 until end of that battle. 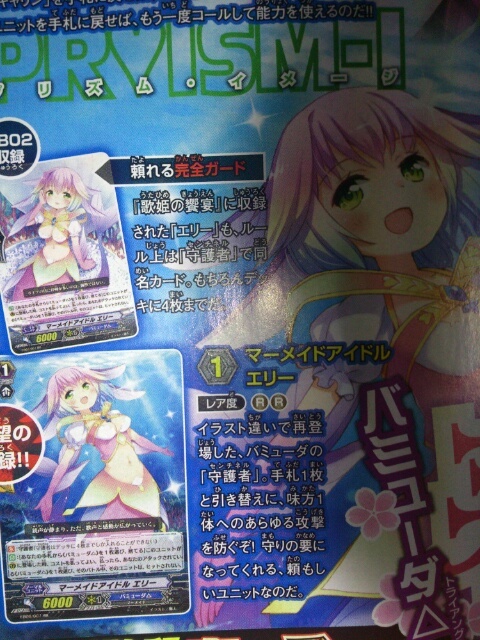 [ACT](RC):[Put this unit into your soul] Choose up to one of your «Bermuda Triangle», and that unit gets [Power]+3000 until end of turn. 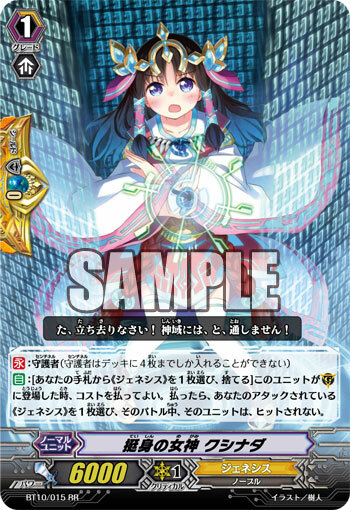 [AUTO](RC):When your «Bermuda Triangle» rear-guard is returned to your hand from (RC), you may return this card to your hand. 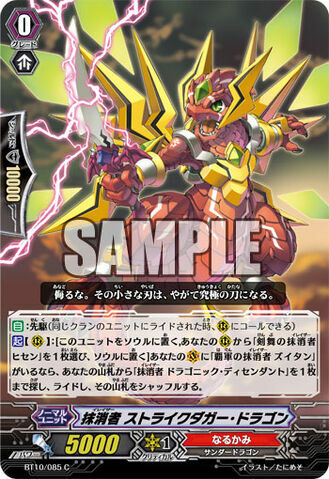 [AUTO](RC):[Put this unit into your soul] When an attack hits a vanguard during the battle that this unit boosted a «Bermuda Triangle» that has Limit Break 4, you may pay the cost. If you do, draw a card. That’s all for this month ! 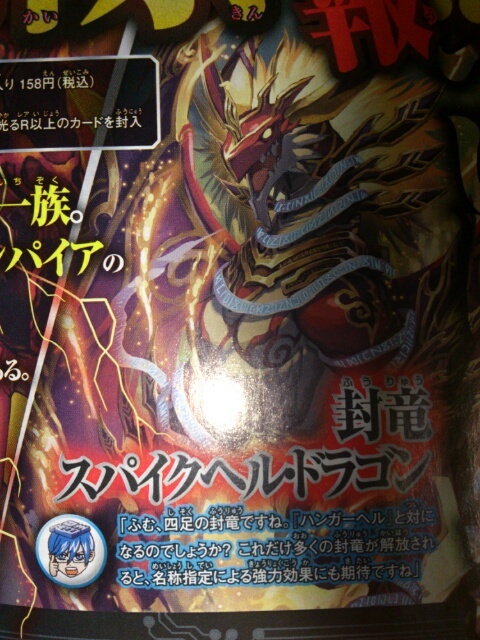 [ACT](RC):[Put this unit into your soul] Choose up to one of your «Gold Paladin», and that unit gets [Power]+3000 until end of turn. A knight of the Black Horse Corps who wields the magical artifact, « The Chains of Blak Steel ». The Chains of Black Steel are weapons that can increase their hardness and destructive ability based on how much magic is poured into them, and since there’s no limit to the amount of power you can pour into them, United Sanctuary has officially labelled it a dangerous B-Rank object. Unlike his younger brother, Kahedin, who has a more reclusive personality, he is quite friendly with his comrades in the Black Horse Corps, and works well with the other groups as needed. The Black Chains bring certain victory to those that hold them, as well as sad scrifice. The Black Horse Knights are people who will take the power and spirit entrusted to them by others, and never forget their courage. 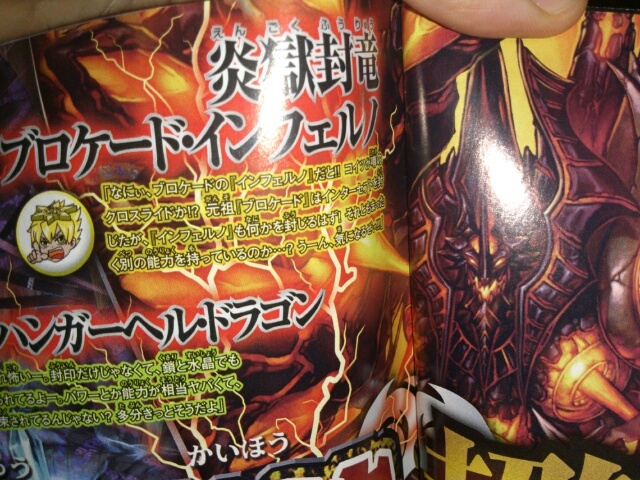 One of the 7 « Gold Paladin » corps who use the symbols of the 7 Sacred Beasts said to protect United Sanctuary. Many of those who join the Black Horse Corps are generally able to use Magical Artifacts and Precious Treasures, and the vast majority of their membership consists of those who used to belong to the Shadow Paladins. Though their motives generally are on the same axis as the rest of the « Gold Paladins », they generally don’t interact with the other Corps too much, and as a result, the state of affairs inside their corps is pretty much an unknown. 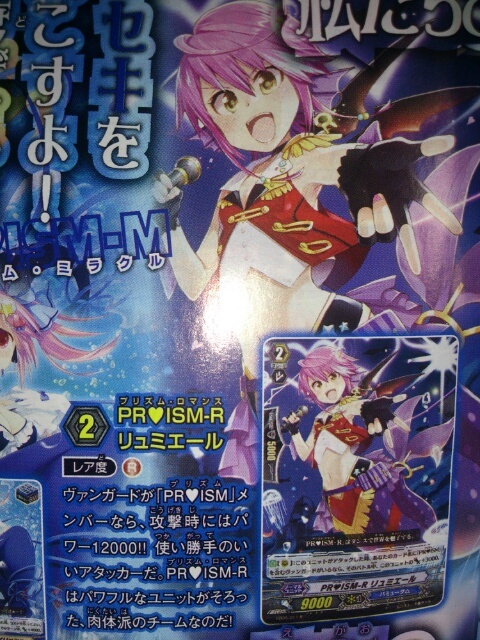 [AUTO]: Pioneer (When another unit from the same clan rides this unit, you may call this card to (RC)). 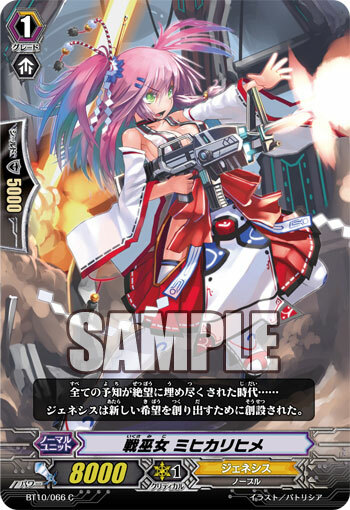 [ACT](RC):[Counter Blast (1) & Put this unit into your soul] Look at up to five cards from the top of your deck, search for up to one grade 3 or greater «Kagerō» from among them, reveal it to your opponent, put it into your hand, and shuffle your deck. A young Flame Dragon who just became old enough to carry weapons. Like a child at this age, he is quite curious and impressionable and really likes others, but he enjoys being a mischievous and trouble-making problem child at school. When he finished the first year of military training, his instructor handed him weapons that were required for training during the second year. They’re dual pistols designed to be handled by a beginner, small weapons that are quite respectable, if quite weak. When he’s excited and launches into the air with glee, it is said he’s strong enough that if he runs into his instructor, they’ll be seeing stars. A goddess who makes full use of modern weapons and artillery, including her personal Mihikari Automatic Rifle, loaded with magical rounds. She planned to join as a guard who would perform maintenance on Battleroids that were proficient with weapons, but because she was shown to be very potent in magic during her aptitude tests, she was appointed to the Battle Maidens who possess a multitude of magical weapons. But she hasn’t given up on being a part of the maintenance team, and between her scheduled duties, its said she appears to help with the maintenance of weapons and Battleroids. And the truth is, she is incredibly skilled, and the members of the team that have seen her work, as well as those she has worked on, hope and pray that she’ll ultimately be transferred. 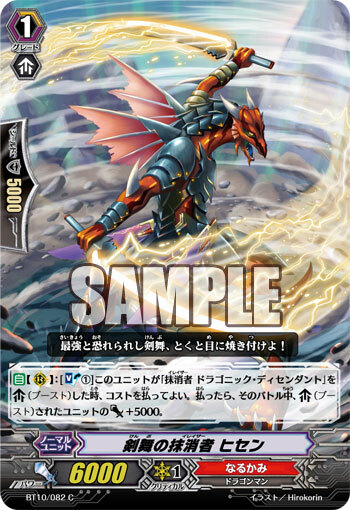 [ACT](RC):[Put this unit into soul & Choose a unit named « Sword Dance Eradicator, Hisen » from your (RC), and put it into soul] If you have a unit named « Supreme Army Eradicator, Zuitan » on (VC), search your deck for a card named « Eradicator, Dragonic Descendant », ride it, and shuffle your deck. A child warrior of « Narukami » who conceals limitless potential. He holds immense respect for the head of the « Eradicators », « Dragonic Descendant ». One day, Dragonic Descendant saw the young boy undergo intense training on his own, away the other soldiers, and sensed a certain « wit » or « knack » sleeping inside him. Though inexperienced, he was enrolled into the Eradicators, to encourage his awakening among those become mighty and strong. An strange selection, he was suddenly transfered to the Special Forces. Looking all around him, there’s no one but veteran warriors. But despite his confusion, he isn’t frightened. He plans to prove he is stronger than anyone else, that he can exceed the limits that stand before him… … The battles that lie before this young drake begin right here. 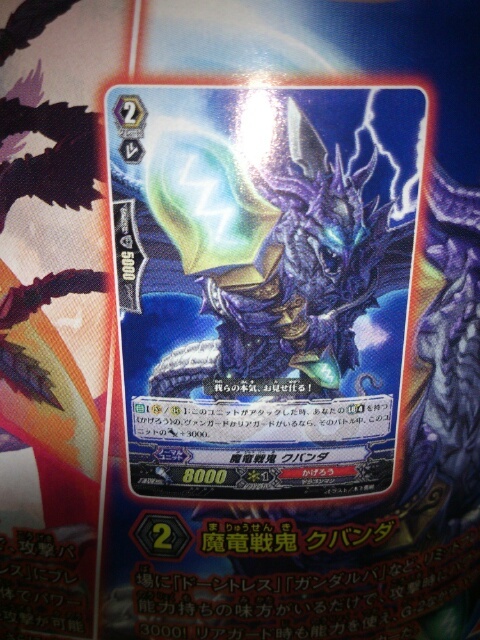 Auti (R): [Soul Blast (1)] When this Unit boosts « Eradicator, Dragonic Descandant », you can pay the cost. If you do, that Unit gains 5000 power during this battle. A master sword dancer in the « Eradicator » division of « Narukami ». A draconian humanoid descended from flying dragons, the wings on his back are nothing more than remnants. He is practically always marching side by side with his commander, « Dragonic Descendant », generally serving as his herald. There are very few people who can get ignore the flurry of his blades and head right for the commander. Other than giving his name or reporting to the commander, he almost never talks on the battlefield. He is always training if he has free time, and finds entertainment and merriment to be useless diversions. There are very few others besides this guy who exemplify the word « warrior ». 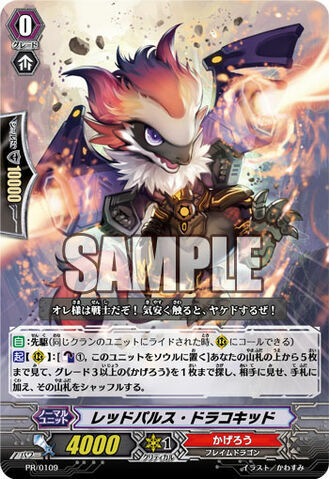 [AUTO](VC/RC):When this unit’s attack hits a vanguard, if you have a vanguard with « Eradicator » in its card name, choose a card from your damage zone, turn it face up, and Soul Charge (1). A young dragon knight who is a part of the « Eradicators ». The swords he carries are scaled down replicas of the Apocalypse Swords. Warriors like him, yearning to inherit those blades, take up blades mimicking them, and learn how to fight using them. To him, it is bliss. It is a goal he has been aiming towards since he was born. But at the same time, he is unhappy. Because he knows that the chances of any warrior climbing to such heights is very small indeed. A knight who seeks further greater glory and victory, he is a youth who continues to aim for ever greater, unseen heights. He wonders, will he be one of those who gets there, or one of those who falls along the way.